With the prolific rise of mobile devices and their ability to offer tailor-made experiences at home or on the go, it’s no surprise that mobile is the key starting point for consumer brand engagement. 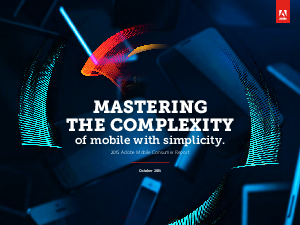 Today’s mobile users have an insatiable appetite for mobile satisfaction—and companies that miss the mark are consequently folding to the competition. If consumers can’t find what they want, when they want it, they’ll find another brand in as little as two minutes who will deliver. In a mobile-first era where consumers will retry an app only one or two times, it’s critical that brands go beyond making a first impression and fashion mobile experience on a deeper level.